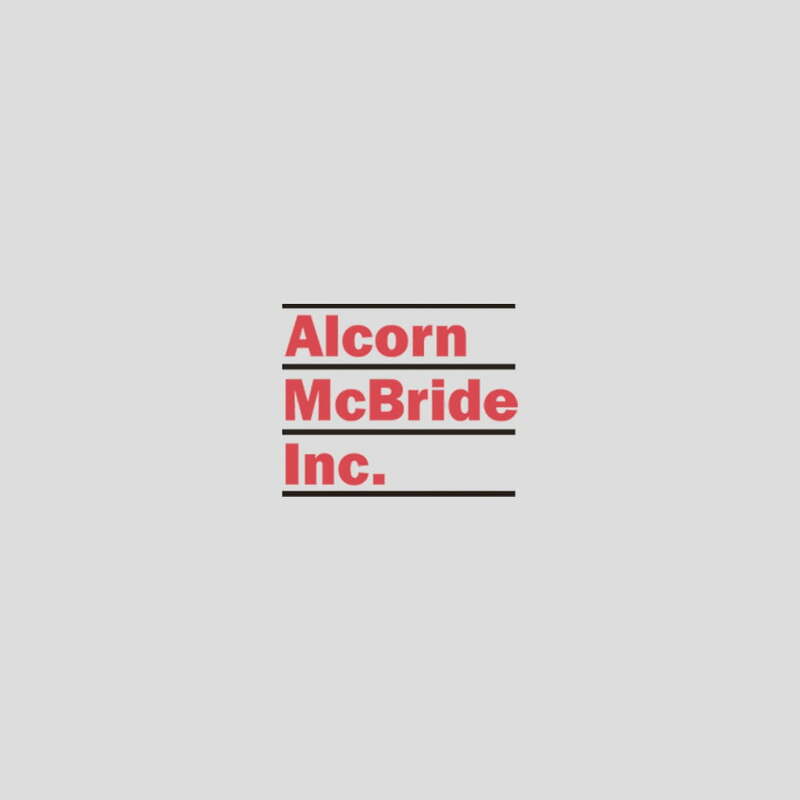 How to Configure Your Network for Alcorn McBride Products? Many Alcorn McBride Digital Audio and Video Products and Show Controllers use Ethernet. This guide will show you how to configure a V16 Pro and other network equipment for optimum performance both inside your facility and across the Internet. Ethernet is a high-speed serial communication standard that involves both hardware and software. The hardware maintains the electrical integrity of all the connections and the software maintains the communication channels by addressing the correct connection throughout the entire network. From a user point of view, the process of connecting a device to a network is simple. In this example, it is assumed that two isolated networks will be used. The first will connect a PC to the V16 Pro for the purpose of show management and programming, while the other will control the show devices such as video or audio players. Let’s connect the V16 Pro to two different networks. The first network will use port A and connect directly to a PC, as a control channel, just like you would use RS232 for downloading. The second network will use port B connected to a switch then to other devices. You will be able to connect as many devices as you have ports available on the switch. If you are connecting directly to the V16 Pro from a notebook or PC you will need a crossover cable. The RED Ethernet cable supplied with your V16Pro is a crossover cable. This cable eliminates the need for a hub, switch, or router to make the connection. When connecting through a hub, switch, or router, a patch cable is used. There will be more on this later. From the viewpoint of the hardware, Ethernet typically uses an eight-wire (four pair) cable that makes a point-to-point electrical connection. When connected to a switch, an Ethernet device is able to communicate with many other devices using the same connection. Do not let that idea bother you because setting up a small network to control your show will be easier than you think. Now a few words on what the difference is between systems using the network to communicate and devices that make up the network. Devices (PCs, V16 Pros, DVMs and such) are connected to the network so that they may pass information to each other. In the first example, the network was a simple point-to-point connection. This is different from a RS232 connection in the fact that Ethernet requires addressing and controls that go far beyond a simple dedicated serial connection. Devices such as hubs, switches and routers make up the network itself. The purpose of the network is to permit as many devices possible to be connected together. Just think of how your PC may be connected to the one down the hall or even to mine way over here or remain connected to mine if I go half way around the world. When many PCs, show controllers and other network devices are all connected together, there must be a post office to deliver the mail so to speak. That is the function these devices serve. So why do we need hubs, switches, and routers to create an Ethernet network? There are different reasons to use each of these devices so lets go over the basic functions of each one of them. Although small control networks are fast and easy to implement, the nature of non-dedicated connections can be hard to manage. As your network grows, maintain a map or chart of the connections. Hubs have become more rare in modern networks because of their low level of functionality. Hubs copy all traffic to all ports at the same time. This slows high-speed networks, which is why they are not used. You may find a hub in an existing network or need one for simple network troubleshooting. These devices are similar to hubs. The nice thing about a switch is that it will send data only to the port connected to the device with the corresponding Ethernet address. Much more traffic can be supported in this unit. If we use the post office example, you send a card to a friend and it goes only to your friend or if you send multiple cards they will all go only to the addressed locations and nowhere else. The Ethernet switch will support as many separate interconnects as it has ports. Another function of the switch is the ability to store addresses and remember the ports used to make the connection. This is valuable because it increases the efficiency of the data transfer. These devices are best for show control networks. These devices are more complex in that they offer a connection between networks (such as your home network to the Internet). If you are planning to control or program your show over the Internet, you will need a router. Please be aware that you may also need an Internet Service Provider (ISP) and network administrator to maintain the security of your systems. If we think about the connections to a network, we need to know how the devices know where they are and how to find each other. The method most commonly used for Ethernet networks is the Internet Protocol (IP). IP uses addresses assigned to devices in the same way your home address is used by postmen to know what mail is to go to your house. In the Ethernet network, the IP address is divided into groups like a home address is divided up for easy reading. For example, your name, house number, street, city, state and zip code are all needed to get a letter delivered to your house. The IP address is also divided into groups but in number form. IP addresses are in four groups of three numbers separated by periods (dots). The default IP address of the V16 Pro, port A is 192.168.0.254 (192 dot 168 dot 0 dot 254) and port B is 192.168.0.253, where each number can be in the range of 0-254. Every port on the network must have a unique IP address just as in the address for your mail. If we think of the IP address as a mailing address for your home, the first number could be the state = 192, the second could be the city = 168, the street = 0 and the house number = 254. We all know how much computers love numbers so we have number addresses for network identification. In order make the connections as fast as possible, there is a parameter that filters the network and is called the Subnet Mask. The subnet mask parameter is another set of numbers such as 255.255.255.0. In the simplest terms, this parameter will limit the network by allowing the IP addresses to be connected that have the same fields as those in the subnet mask having the 255. So the IP address, in our case 192.168.0.254 (port A), will be able to communicate with all other devices that have 192.168.0. (0-255) as their IP address. If the subnet mask is 255.255.0.0, the device could communicate with other devices in the range 192.168.(0-255).(0-255). IP addresses that end in 0 are special, as are any value of 255; these are not used for simple networking. In short, the smaller the subnet mask-number the larger the subnet of the network. You may never need to change this parameter unless you need to communicate with more than 254 devices. The Gateway parameter is another way to isolate very large networks. The gateway address is the IP address of a router or similar device that is connected to more than one network. It allows a computer on one network to ask for the address of a device on another network. We can now configure the machines on our networks as shown in the diagram that was introduced at the start of this section. We will connect to two different networks. The first is the Control Network and is the simplest of all. This is a point-to-point network and will have the PC connected to the V16 Pro on port A. The second is the Show Control network and will have more hardware involved. This network will consist of the V16 Pro port B connected to a switch then to a couple of Alcorn McBride DVM7400 video players. The switch allows the V16 Pro to communicate with multiple devices on the same network. Each device must have an IP address assigned. Pick an address that you will remember for the PC’s IP address. It is best to keep the IP addresses of your devices separate from those of the other networking equipment. For example, put network devices like routers, servers and gateways that need an IP address down low in the address range (1-99) and devices to control such as the V16 Pro, higher in the address (101-199). As you build a bigger and bigger network make a network IP map or list, as this will save you lots of time when tracking down issues. We can now set the PC Ethernet port parameters. The point-to-point connection is the simplest network configuration. That being, your PC connected to another device like the V16 Pro. Because we are connecting directly to another device and not to network connection equipment (i.e. hub, switch or a router) we must use the RED crossover cable. Note: The crossover cable is used with this simple connection setup called a point-to-point connection. You may find this cable connecting devices to network equipment a router or switch that has a cable auto detect feature, but not all-networking equipment will support this. Locate the Ethernet port on your PC and connect one end of the red crossover cable to that port. Next, locate the Ethernet port on the V16 Pro and connect the other end of the cable to port A. The Ethernet ports are located on the backside of the unit at the lower right. This completes the hardware connections for network A. The port B on the back of the V16 Pro will be used to control multiple devices in our example. It will be referred to as network B. This network will require an Ethernet switch because we will be connecting more than two devices to the network. The V16 Pro port B is connected to any port of the switch with a patch cable. A patch cable is a straight-through cable, as opposed to a crossover cable. It is a good idea to begin building a connection map or list so that the cabling can be identified later if need be. The ease of connecting additional devices to the network or moving them will make for some interesting tangles and confusion later on that may need to be sorted out later. It is also a good idea to start naming all the devices connected to the network as well. You will have to refer to them in some way, ether by the IP addresses or by a descriptive name. When writing your show control script later on, referring to the devices by a name will be far easier then by the IP address. You can refer to the devices by IP if you wish however IP’s are not very descriptive and might make your script hard to read and update later. Only the network needs to know the IP after the programming is complete. Anyway, 192.168.0.101 is not as fun as its job function such as “BirdsOfPrey” or “FlightExhibit” for example. We will use the name DVM7400-1 for the first video player and DVM7400-2 for the second in this example. This will all become clear when we begin the script programming. Connect the DVMs to any of the ports on the switch or router. Connect all the units to power and the network B hardware is done. 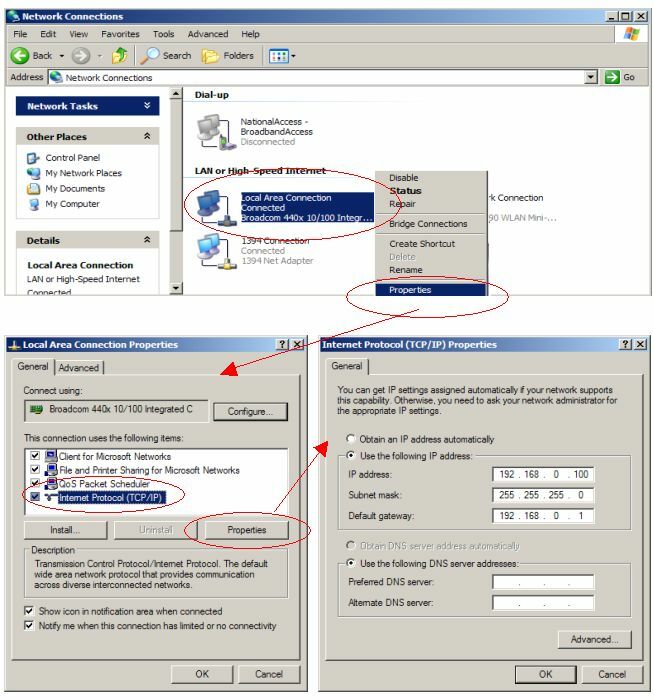 For this example Windows XP is used, if another OS is being used the parameters are the same but the way to get them into the system will be different. Open the “Control Panel” and find the icon “Network Connections” and open that window. If the network ICON is present in the tray in the lower right side of your screen then you can right click it to open the options menu. This ICON looks like to computer monitors together. You may have several network connections here so look for the one that refers to your local area connection that is not wireless, 1394 or a modem. 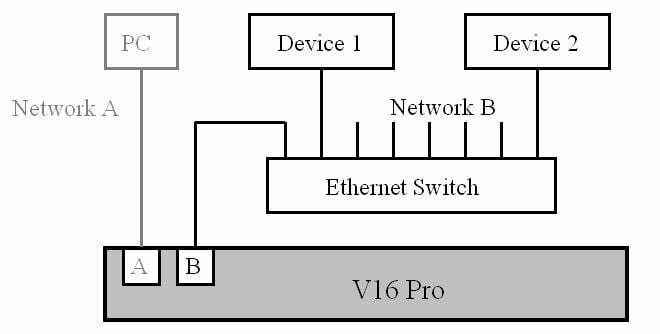 You will need to identify the connection that controls the Ethernet port on your PC that will in turn be connected to the V16 Pro. This will take some understanding of your PC configuration. Next, right click on the icon that control your Ethernet port and go to Properties menu item and click to open that window. Then click on the Internet Protocol (TCP/IP) menu item them click the properties button. Click the “Use the following IP address” radio button. Enter the IP address for you PC’s IP address of 192.168.0.100 or what ever address you want to use. Enter the subnet mask of 255.255.255.0 if it is not already filled in. Skip the Gateway IP address or fill in the address as shown below. You computer must be rebooted to change the IP parameters. You can follow the map below if you prefer. The configuration of the V16 Pro should be setup by default. If changes are needed or if parameters need to be verified, then go thru the following steps to understand how to configure the port parameters. Turn on the power to the V16 Pro and allow it to boot and load a script from the flash card it is present. Press the menu wheel to access the menu system. Spin the menu wheel to highlight the Network menu item. If changes were made the V16 Pro will need to be power cycled for the changes to take effect. The final step in configuring the networks is to identify the hardware devices with the assigned IP addresses. Up to this point only the devices knew their IP addresses. Now it is time to tell the software who and what is out there. Filling in the forms in the Winscript Live software make this easy. Open Winscript Live and click OK to the “New Script” dialog or open a script of your choice. Verify the form has the data as shown below to complete the connection of network A – the control network. This network connection will be the channel by which the PC, thru Winscript Live, will perform show scripts downloads and uploads, update V16 Pro firmware and to control the V16 Pro with much greater speeds than RS232 could obtain. The Live function will also be greatly enhanced with the larger bandwidth supplied thru the Ethernet connection. You will find that all the communication functions will be faster and easier then every before. And now a few words about the “Device UDP Port” number. Each time a channel is opened by the device the operating system will assign a port number along with the IP address to that link. This is done to keep track of the channel connection called a thread. The OS can now communicate with many different applications thru one IP address. The PC can run many applications at the same time, which requires the multiple port number assignments. The V16 Pro does not run multiple applications; however, the operational modes of the V16 Pro will change. So the defined port number are port 2638 is reserved for ASCII remote control, port 2639 is used for downloading scripts and port 2640 is used for the “Live” mode communications with the Winscript Live software. With Winscript Live open, close all the open windows except for the script. If you notice the far left side of the window, you will see a vertical menu list. On this menu you will see an item called Devices. Click on it to open the “Devices” configuration form. Double click in the empty “Device Type” field and the configuration wizard will open and lead you thru the port configuration. The first dialog box asks for the name you want to use to identify the device, as before “Curly, Larry, Moe, and BirdsOfPrey or FlightExhibit” are examples. We will use DVM7400-1 and DVM7400-2. The next dialog box asks for the manufacturer and the wizard will ask for additional information such as model and version. 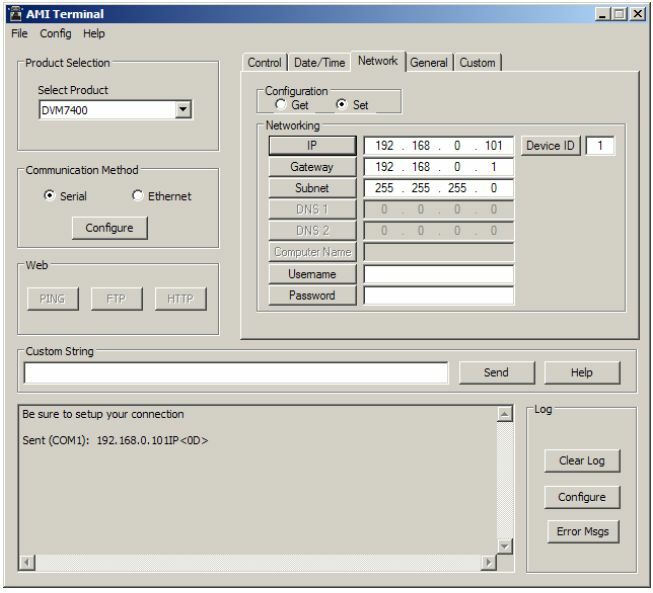 The next dialog box asks for the Connection type and if the Ethernet connection is selected you will see the other parameters mentioned before. Select Ethernet, port B and pioneer protocol format. Now this is where you will link the IP address with the device name. Enter the IP address you want to use and for our example use 192.168.0.101 for the DVM7400-1 and 192.168.0.102 for the DVM7400-2. In all cases use the UDP port number of 2638. The form should look like the one below and have the following information. Take a look at the form and the associations that are made. Scripts will use the Name in the name field to identify the unit on the network. One final step remains and that is to assign each of the DVM7400s an IP address. This is why device map or list should be created to keep track of names and addresses. It will be very helpful to know what addresses are free to use when adding additional devices to your network. 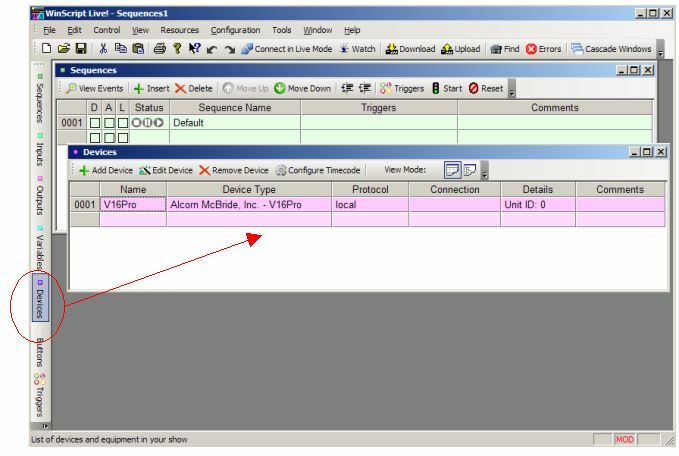 Connect to the serial port of the first DVM and open AMITerm software. 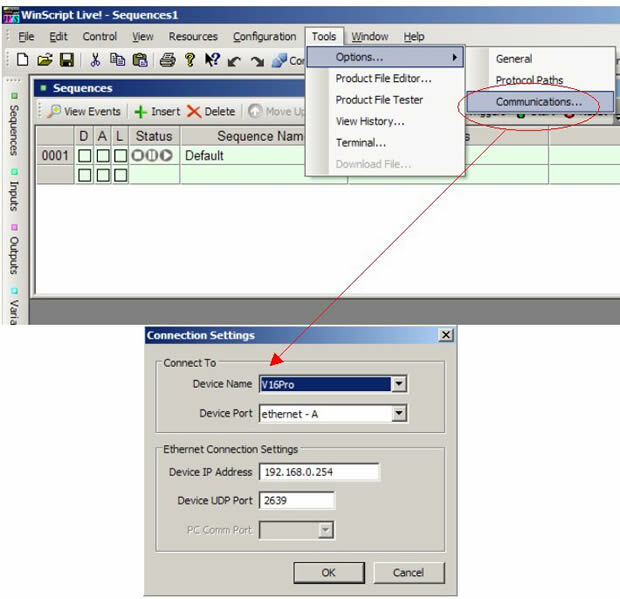 Click on the Network tab and under the Configuration Box click the Set button. Next go to the IP field and edit the last number changing it to 101. Click the IP button and observe the message in the box at the bottom left of the AMITerm window. The receive response must be R to verify the new address was understood. See the diagram below for the locations and function of the items just described. The DVM7400 will need to be power cycled to complete the configuration. Do these steps to all the devices you wish to connect to the network. Be sure none of the units have the same address or the network will have trouble. The show control side of the network is now complete. The system is now ready to receive scripts from port A and control the show from port B. Now that the hardware is setup, the next steps are to write a script, load it into the V16 Pro then enjoy the show. If you wish to use a ready to run script, you can download the “EthernetStepByStep” script from our web site. If you have only one DVM7400 you can use this script as a starting place and remove the references to DVM7400-2 from the “Devices” and “Sequences” forms. The script is very simple to show off the Ethernet network capability of the V16 Pro. With that being said, the DVM7400-1 will play “vid00001.mpg” when button 1 is pressed and DVM7400-2 will play “vid00001.mpg” when button 2 is pressed. If you have used Alcorn McBride show control devices in the past you will find the V16 Pro and WinScript Live to be friendly and familiar. You need only edit the device configurations (port connections) to switch from the serial port control to using Ethernet in your currently running shows. If you are new to Alcorn McBride, welcome to the exciting world of show control.